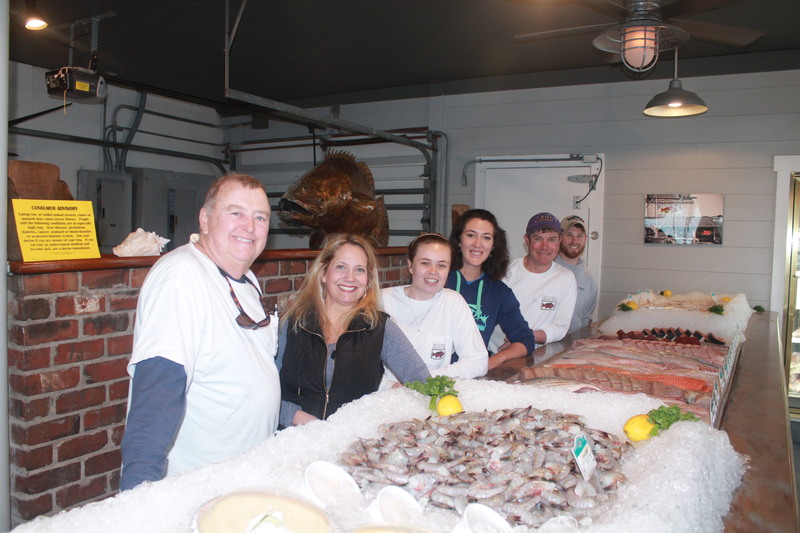 Motts Channel Seafood owners Gene and Alison Long, with employees Branson Best, Krista Johnson, Tom Franz and Wade Kelly. Still months out from completing repairs and renovations following Hurricane Florence, fans of Wrightsville Beach market Motts Channel Seafood would come to the store to check if it had reopened, despite obvious signs of construction. So once repair crews had gotten the building repaired well enough to reopen last Saturday, word spread quickly that Motts Channel was back in business, owner Gene Long said. Returning customers to the fish market were greeted with a remodeled retail floor, with fresh fish still front and center. The remodel allows more room for retail items, including sauces, sides, produce and apparel. With the redesign, Long said the market would also apply for a license to sell beer and wine that can be consumed off premise. Motts Channel has been closed since Hurricane Florence, which destroyed both docks at the building, and created 30 holes in the roof, each of which contributed to the flooding that damaged the insulation, walls and ceiling. Despite the four-month layoff, several of the Motts Channel employees were able to return, with only three taking other jobs. While where is still work to be done on the building — neither of the two docks have been built yet — the owners are already moving ahead with plans, including rescheduling the Mandie Phillips Memorial Fishing Tournament. The third edition of the tournament, named for a former employee killed in a car accident, was scheduled for September 2018, but was postponed after the storm damage was realized. However, Motts Channel co-owner Alison Long said that the tournament would be held April 18 – 20. The tournament raises scholarship money for New Hanover County students seeking to attend Appalachian State University. The four-month shutdown was not the first time Motts Channel had to close after a storm. The market, which first opened in 1989, closed for nine months following 1996’s Hurricane Fran. While Gene Long said that back then he did all the work himself, this time he hired crews to speed along the process. He didn’t have a cost estimate for these renovations. “I’m scared to add it up,” he said.